The long-awaited reunion of the bluegrass super-group Nickel Creek does not disappoint. A Dotted Line does modern bluegrass unlike anyone else, with a pop feel and even some edgy sound. The Grammy Award-winning, multi-platinum selling trio Nickel Creek-Chris Thile (mandolin/vocals), Sara Watkins (fiddle/vocals), and Sean Watkins (guitar/vocals), returns from its 2007 "indefinite hiatus" to release its Eric Valentine-produced sixth studio album. As Nickel Creek's 25th anniversary approached, the band members decided they ought to mark it in some way, so they got together to write music in Chris Thile's apartment last year. They ended up with six new co-written songs, which they eventually took to a Los Angeles studio, along with one tune by Thile, one by Sean Watkins, and two covers: Sam Phillips' "Where Is Love Now" and Mother Mother's "Hayloft." There they worked with Valentine (Queens of the Stone Age, Smash Mouth), who had produced Nickel Creek's previous album, Why Should the Fire Die?. "We were excited every day to be there," Sara Watkins says. "Having grown up singing together, there is something natural about our voices and it's really fun to harmonize. Our voices have come to match each other's really well. Sean and I are siblings, and Chris is about as close to a sibling as you could get." Sean Watkins continues: "It feels more natural and easy than it ever did, by far. Getting to spend time alone with our own musical personalities has helped us mature." 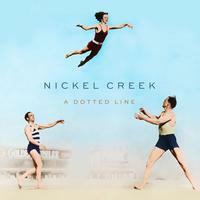 A Dotted Line is, in fact, more adventurous than Nickel Creek's earlier work, and more expressive of each player's strengths. writes NPR Music. Thile has the glamour of a heartthrob, and he sings with swagger in the album's breakout power-pop number, "You Don't Know What's Going On," and its most headily poetic ballad, the heartbreaker "Love of Mine." Moving between her brother's earth and her compatriot's air like the woman on the album's cover, Watkins is the listener's close companion. Her fiddle lines are warmly authoritative, her voice always certain of the direction it takes even at its most vulnerable, as in her pensive reading of the Sam Phillips song "Where Is Love Now?" — so distinct from Jimmie Dale Gilmore's equally definitive version. At the end of the doleful lover's story "Christmas Eve," each singer takes up the phrase, "It's not all over yet" in a spontaneous not-quite-round, bending the notes toward a minor key and lifting the lines back up — almost clashing, but always just resolving, like one hurt brain determined to keep its swirling thoughts in order.